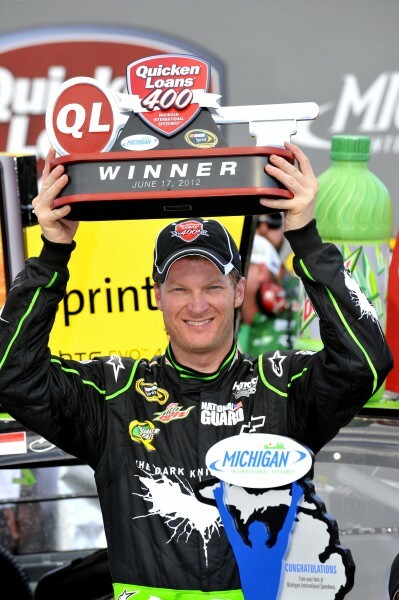 On any given Sunday Dale Earnhardt Jr. was due to end his winless streak, and end it he did during Sunday’s Quicken Loans 400 at Michigan International Speedway. He is to date the only driver to have completed every lap so far in the 2012 season, and has six top fives and twelve top ten finishes so far this year. It’s that kind of consistency that put Dale Earnhardt Jr. in victory lane on Sunday. With 70 laps to go, junior’s car was hooked up and drove as if it were on rails. He was just flat-out fast on the restarts and was able to pull away from the pack on the high line. With around 20 to go Tony Stewart was running second and said to his crew chief “Don’t worry, he ain’t going nowhere”. That statement proved to be wrong as Dale put a hurtin to the rest of the field with a five second lead on the second place car which was Stewart. Dale crossed the finish line and all of Junior Nation rose to their feet in the grandstand to show support for Dale Earnhardt Jr.; It brought cheers and tears to many fans wearing green that day as their driver did a nice smokey burnout past the grandstand. When he crossed the finish line in true Dale fashion, he radioed into crew chief Steve Letarte and said “I don’t know what to say”, Steve replied “You Really won it Dale!”. On his way to victory lane he was meet win high fives and praise from his follow competitors, and also got on his cell phone to call team owner Rick Hendrick. Dale thanked him for standing by him and not giving up hope during the tough times. He was also greeted by president of NASCAR Mike Helton who congratulated Dale. Dale’s win on Sunday wasn’t just a win, it was just a great “feel good moment” for NASCAR in which many fans banded together to celebrate with NASCAR’S most popular driver. …long time comin’ congrats Jr.! Dale did it! The President of NASCAR even congratulated him. I’m sure he was very happy and proud of his achievement.